Do you use Google Drive? If you use Google Docs, Google Sheets, Google Slides, Google Forms, or Google Drawings, the answer is yes. Nearly 1 billion people use Google Drive. Think of how much of your data is stored by Google! 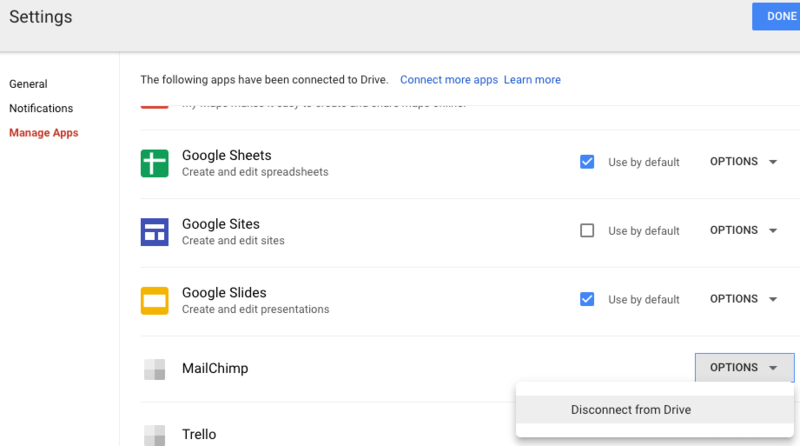 Google Drive makes it simple to share files and collaborate on files. However, in my experience, most people have no clue who has access to their files, or what they can do with them. Google Drive integrates with many other websites and apps, making it easy for you to grant third parties access to your files. I’ve found that most people don’t think carefully before granting such access, and they rarely think about that access once they’ve granted it. For these reasons, it’s critical that you take the time to set your security and privacy settings in Google Drive. Let’s walk through them. Open Google Drive. Click the gear icon in the top right, then click Settings. Offline: Google Drive has an option to sync files to your computer so that you can edit them offline. You should uncheck/disable this if you share your computer with others, or they may be able to access your offline files when you’re not around. Manage Apps: From the menu on the left, click Manage Apps. You’ll see apps that are connected to Google Drive. For any you no longer need, click Options > Disconnect from Drive. On – Public on the web: Anyone can search on Google and get access to your file, without signing in to their Google Account. On – Anyone with the link: Anyone who has the link can use your file, without signing in to their Google Account. Off – Specific people: Only people you share the file with will be able to use it. Of course, you need to remember that Google can see/read any file in your Google Drive, regardless of your sharing settings. Learn more about sharing files. Pay close attention to who you share files with, and what you allow them to do. Share with as few people as is truly necessary, and give the lowest level of access that is truly necessary (follow the Principle of Least Privilege). Note that if you use the option Get shareable link on a file that is not shared, it may automatically be changed to Anyone with the link can view. That’s not very restrictive, so it’s better to not use the Get shareable link option. Instead, always use the Share option, and grant access to specific individuals. You can still find the link to share by clicking Share, then Advanced. Unfortunately, you may end up needing to grant access to anyone with the link, if one or more of the people you’re sharing with don’t have Google accounts. When you no longer want to share a file, click Share, then Advanced, then click the X next to the person you no longer want to share it with. Learn more about unsharing. I think most people don’t realize that when you delete a file you’ve shared, the person or people you’ve shared it with can continue to access the file until you permanently delete it. To prevent this, you need to either unshare the file before you delete it, or go into your Trash and permanently delete the file. Learn more about deleting shared files. You can also share folders, but be certain that you want the sharing settings to apply to all the files in the folder. Also, the settings apply to any subfolders (folders inside the folder), so be careful of that too. The security of your Google Drive largely depends on the security of your Google account. Be sure to learn from my Google Account Security & Privacy Guide. If you use someone else’s device (computer, phone, tablet, etc.) to log into Google Drive, be sure to log out when you’re finished! Otherwise, the other person can use Google as you after you leave. Send/share it without using Google Drive. Use Firefox Send or an end-to-end encrypted messenger, such as Signal or Wire. Encrypt the file on your computer before putting it in Google Drive. If you have a Mac, you can create an encrypted image. For Windows, Linux, or Mac, you can use VeraCrypt or other file-encryption software. Regularly review the third-party apps that have access to your Google Drive (see Manage Apps above). It’s a good idea to limit the files you keep in Google Drive, just in case someone gains access to your account. Regularly delete files you no longer need. They’ll go to Trash, where they’ll sit indefinitely. So you should also regularly permanently delete files from Trash.